Welcome back to Power Rankings for the 2019 Cup Series season. We’re never going to cut horsepower here. Busch finished third on Sunday. That’s good enough to keep the top spot. Busch felt his team overachieved from where they had started the weekend, though this is a guy who has pretty high standards. After all, his 2019 Cup Series winning percentage fell from .400 to .333 with Sunday’s non-win. Busch kept his perfect record intact in the Truck Series on Saturday with his third win in as many races. That was his 201st win across all three NASCAR series. While Keselowski and Busch have been part of the final four at Homestead in each of the past two seasons, they haven’t really raced each other for the title in those two races. When Keselowski won the title in 2012 he had to beat Jimmie Johnson to get it and Keselowski had just one win and nine top-five finishes in Busch’s title-winning season of 2015. Now that Keselowski and Busch each have two wins in the first six races of the season it’s easy to dream that this is the year where the two rivals go head-to-head for the duration of the season for Cup Series supremacy. 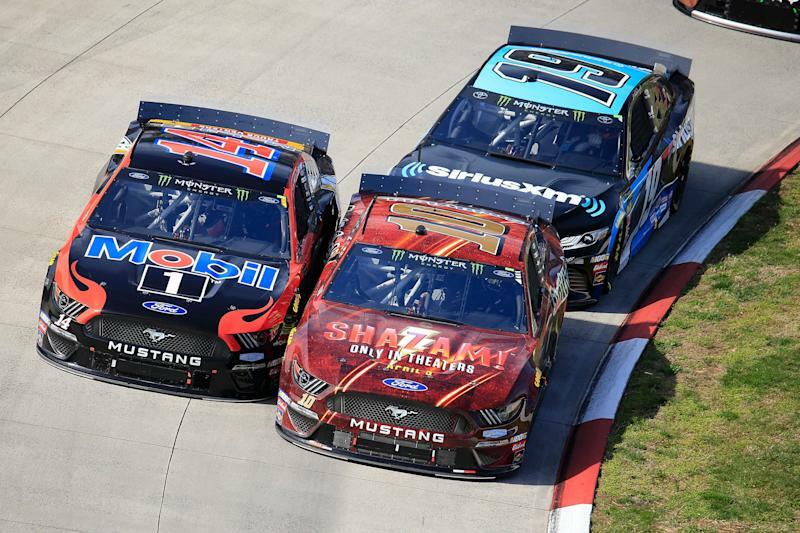 A NASCAR that constantly looks for rivalries has a really good one between Keselowski and Busch that could kick up a couple notches if the drivers keep trading wins. Mark it down, Kevin Harvick wins on Sunday at Texas to break the stranglehold that Penske and Gibbs have on the 2019 season. Harvick won the fall race at Texas, though that win was later taken away thanks to some illegal machinations in the spoiler area. Harvick has also been pretty damn good himself so far in 2019, even as he hasn’t been to victory lane. His average finish is 8.8 — the same average finish that he had in 2018 when he was third in the standings and won eight races. Logano had the pole on Sunday and his car immediately faded after the green flag flew. He was passed for the lead within six laps by teammate Brad Keselowski and was seventh at the end of the first stage. He was then 10th in the second stage. He finished 19th after sliding back even further in the final stage. Guess what? Hamlin had a pit road penalty on Sunday. This time it wasn’t for speeding though. An uncontrolled tire during his pit stop at the end of the second stage put him at the back of the field. He drove through and finished fifth. Hamlin said after the race that he felt he had a car that was third at best, so fifth is a reasonable result. Especially for the comeback. The guy that was just ahead of Hamlin was Blaney. Blaney had a car that was stronger on the longer runs and figured he had a shot at winning the race if a caution didn’t fly on lap 447. “For like 110-lap run to the finish is what it was gonna be, 120 [laps], I was like, ‘man, that’s perfect. We’re gonna get them here,’” Blaney said. “Our car was just starting to come to us. We just got to third and the caution came out and I was like, ‘I don’t know if we’re gonna be able to fire off alright,’ and we didn’t and we kept losing spots on pit road and you can’t have that. Elliott moves up five spots after finishing second on Sunday. That finish makes him just the second Chevrolet driver to score a top five this season. While that’s a good sign for Elliott (and perhaps Hendrick Motorsports), that’s not the greatest of signs for Chevy. 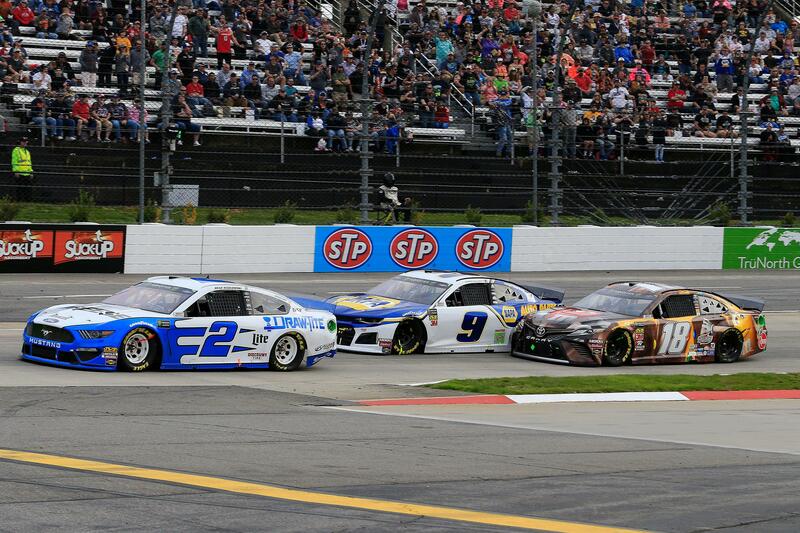 Elliott didn’t appear to have the cornering ability that Keselowski had over the final 50ish laps of Sunday’s race. Even as Keselowski said he felt Elliott had the best car throughout the race. He never got close enough to Keselowski to try the bump. Truex started eighth, was eighth at the end of the first stage, fifth at the end of the second stage and eighth at the end of the race. Safe to say that he had a top-10 caliber car. His crew chief Cole Pearn added some food for thought after the race. When Pearn tweets, he makes it count. That was his first tweet in six days. 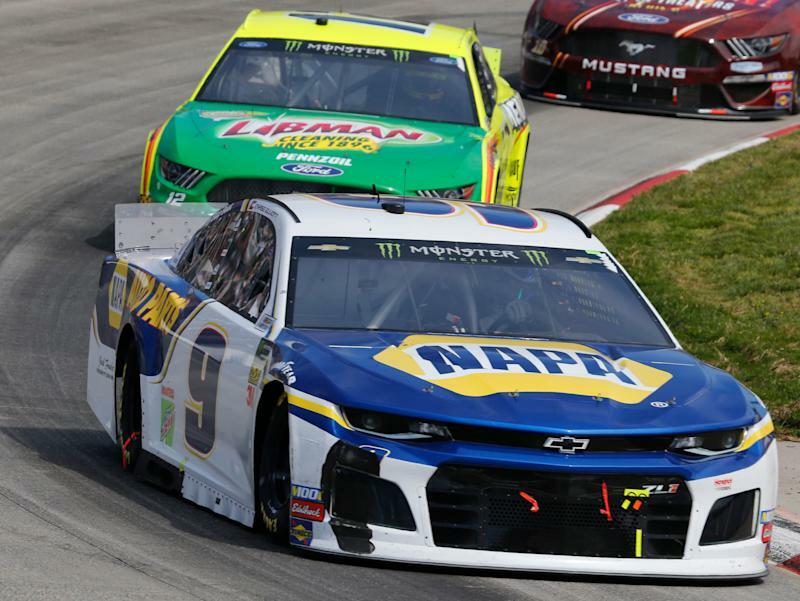 Speeds were up at Martinsville on Sunday because of the increased downforce added to Cup cars in 2019. The race was pretty tame. Are the two connected? Maybe. The 2018 spring race had even fewer cautions. Busch falls three spots after finishing 12th. A tad harsh, but the guys who moved ahead of him all finished inside the top 10. He did jump ahead of teammate Kyle Larson in the points standings. Larson is now three points back of Busch. Almirola finished ninth after starting second. He blamed that loss of track position on poor pit stops and a run-in with Kyle Busch. “We just lost a lot of track position on pit road today and then [Busch] got in my left-rear quarter on one of those restarts. I got together with [Truex] off two and had to check up a little bit and [Busch] kind of bonsai’d it down there into turn three and about wiped me out. Bowyer had two pit road speeding penalties. He finished seventh. That’s an even more impressive comeback than Hamlin had. Larson started sixth and finished 18th. Martinsville is not one of his good tracks. He’s finished in the top 10 just once and has finished 30th or worse in four of his 11 starts at the paperclip. Lucky Dog: Daniel Suarez finished 10th … and was fourth out of the four Stewart-Haas Racing cars. 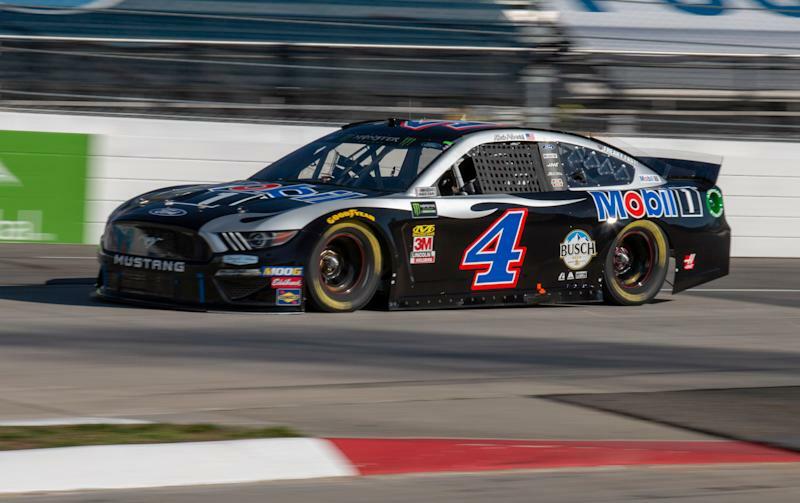 The only time he hasn’t been last among his four-car team was at Auto Club Speedway when he was third in the pecking order thanks to Clint Bowyer’s engine issue. The DNF: Erik Jones cut a tire and got some damage after a restart and his day was ruined. A potential top-10 finished turned into a 30th. Dropped out: Ricky Stenhouse Jr.